You may have been able to ignore it for a bit, but at some point there’s no getting around it: The inside of the windshield a hazy mess that needs to be cleaned. But where does that cloudy residue come from? And what gets rid of it? The short answers are your interior and glass cleaners. The oily haze on the windshield comes from airborne contaminants wafting off plastics, vinyls, carpets and polymers inside your vehicle. A quality glass cleaner will do away with spots and film on the inside of your windshield. Use a streak-free glass cleaner, apply to a terry cloth towel and work in straight lines for best results. 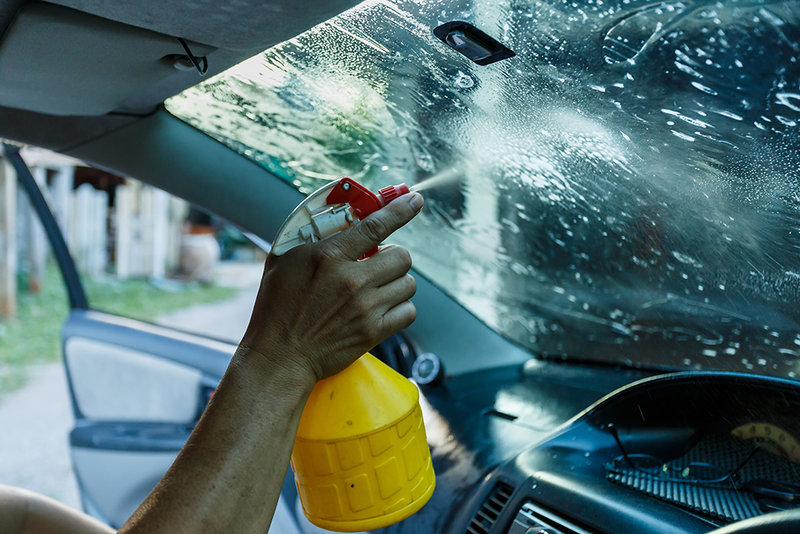 Applying a defogging product to the inside of a clean windshield provides a barrier against the residue in the future. Use a glass cleaner designed specifically for automobile glass. They help prevent streaks. Streaks=glare. Clean interior and exterior glass surfaces thoroughly before applying window treatment products. Anti-fog products dissipate moisture, helping it evaporate. They are for use on the inside of a windshield. Apply window treatment products with a terry cloth or microfiber towel. Spray the towel rather than the surface and wipe it evenly across the glass. Remove excess fluid with a clean, dry cloth to eliminate haze. Avoid getting window treatment products on rubber surfaces. They contain alcohol and can cause rubber to dry or crack.